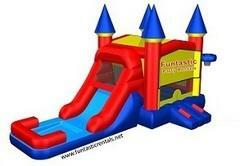 Enter the inflatable into a bouncing area. Climb up the ladder and slide down into a splash pool! The inflatable also has two hoops, inside and outside, where you can play basketball (with a regular size basketball) while others are taking their turn sliding down. The inflatable pool can be used dry, with water, or with plastic balls (not provided).